Updated. With a rising number of employees bringing their own smartphones into their companies, the race is on to see who can help enterprise customers secure and manage this emerging fleet of devices. The latest entrant to the space is Enterproid, a New York start-up that has built an app environment for smartphones that separates corporate data from personal information. The company, which is presenting at the DEMO conference today, is looking to strike the right balance between IT demands and end-user needs. The result is a secure encrypted environment called Divide that mimics virtualization but isn’t tied to the hardware. Instead, it’s a partitioned area within the interface that comes with its own applications for web browsing, email, SMS, calendar and contacts. The first version, which will launch on Android (s goog), can be accessed by a tap of the app icon or through a double tap of the home screen button. Divide then launches into a distinctive profile that is secure from the rest of the phone. Andrew Toy, CEO and co-founder, said the system doesn’t require dedicated servers and leverages Microsoft ActiveSync (s msft). It works with Enterproid’s cloud-based management system, allowing companies to provision devices within minutes. He said IT managers and individual users can manage, secure, find and remotely wipe devices from a cloud-based console. Companies can also build their own internal apps for Divide using an API. Divide is currently in free private beta on Android devices running 2.2 or higher and will open up later this year to customers. IPhone (s aapl) and Windows Phone 7 versions are expected by the end of this year. Pricing hasn’t been disclosed, but it will run on a tiered subscription basis in the future. Enterproid steps into a market that’s increasingly getting hotter, and more crowded, as companies deal with an influx of employee-bought smartphones and tablets. IDC projects that by 2014, there will be more than a billion smartphones in users’ hands, with 75 percent of employees in large companies using them for business. Good Technology, which has been one of the leaders in securing smart devices, said last year that monthly growth of enterprise iOS and Android deployments was meteoric. 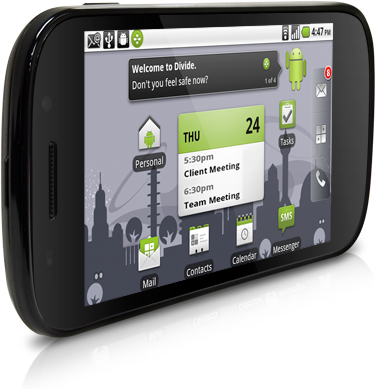 VMware (s vmw) finally unveiled its plans for mobile devices by partnering with LG to bring virtualization to Android devices. Motorola (s mmi), which actually sold off Good Technology, showed its intentions to get back in the space by buying up 3LM earlier this month. And Sprint (s s) just announced a Total Equipment Protection app Monday morning to allow consumers secure, locate and remotely wipe their BlackBerry (s rimm) and Android devices. There’s a big opportunity now with the consumerization of IT. Users want to bring in their own devices, but they don’t want to submit to heavy-handed device lock-downs by management, and many aren’t keen on carrying around two gadgets. I think Enterproid has a good take on how to handle this. It doesn’t require much hardware investment for companies, so it’s especially good for smaller IT shops. It achieves a kind of app-level virtualization without having to be baked into the hardware. That allows it to run on a lot of devices. And because it’s a secure environment that looks like a version of the Android interface, it feels more natural jumping back and forth. This is going to be a big battleground as companies and platform makers look to lock up corporate clients. Enterproid’s team, for its part, has some deep mobile roots. Toy was previously VP of mobile and syndication technology at MTV Networks (s via) and used to run mobile application development for Morgan Stanley. He’s joined by co-founder Alexander Trewby, former VP of mobile development at Morgan Stanley (s ms) and David Zhu, the former director of engineering and first employee at audio app maker Smule. The team has received about $2 million to date from Genacast Ventures, NYC Seed and a mix of angel investors. Update: Qualcomm (s qcom) announced that Enterproid won its Ventures QPrize international venture investment competition, beating out five other competitors from around the world. In addition to bragging rights, the win gives Enterproid $150,000 in convertible note funding from Qualcomm.